I was so pleased with the pencil work results that I finished the painting! In fact, I liked it so much that I signed it. 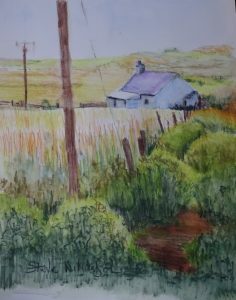 I am enjoying the quiet, steady, progress of the painting technique – I can’t believe I wrote that – it fits so well with the time and place in which I can paint and I am discovering new aspects of myself. I had not thought that the prejudices I had overcome when painting for “The Bridges of Dee” would be followed so quickly by the collapse, the total collapse, of my fear of pencil drawing. Looking back, I see that “fear” is the right word. I am only in the foothills but this is a mountain worth conquering. Finally I can lay out in free hand a preparatory sketch before painting, and I am sure that as I practise this new skill, that freedom will translate to my brush and pastel. What have I learnt so far ? 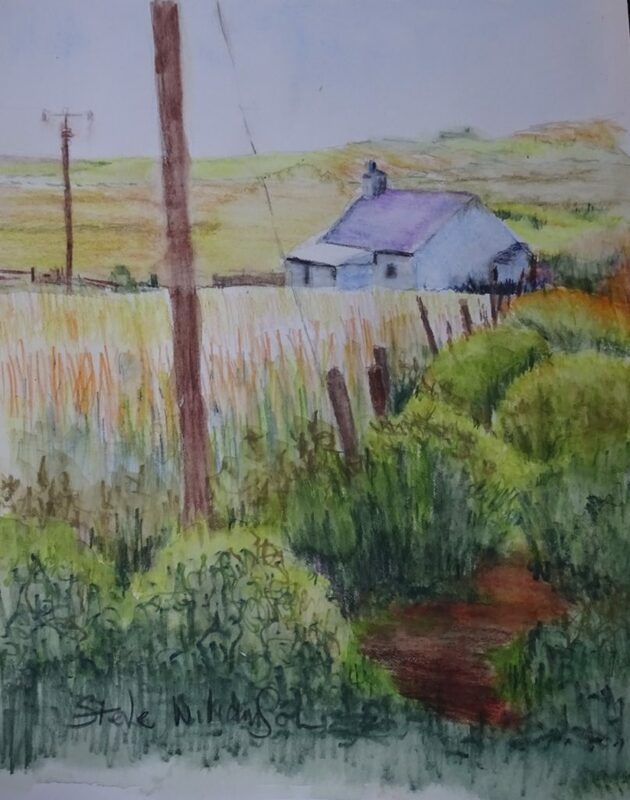 If a pale wash is wanted, certainly on hot pressed paper, scrubbing the pencil on a spare bit of paper and lifting the colour on a wet brush is working satisfactorily (the sky); texture and detail can be indicated at will and either left to speak for itself or melded with the painting by a wash of water (the distant hill and the hay field); more graduation of tone came be achieved by mixing the wet paint on the paper (the bushes); this can then be worked on to introduce more texture; very deep tones have come by working directly into wetted paper with the pencil. I am not surprised you signed it. It is lovely. I am looking forward to experimenting with your techniques since mine have been pretty basic so far. Pencils are so completely self-contained that I shall continue with them for watercolour rather than using tubes – no mess, immediately available and excellent for views from windows!